CORPUS CHRISTI, Texas (Nov. 13, 2018) – It was one of the best fights of 2017. WBO Super Middleweight world champion Gilberto “Zurdo” Ramirez had Jesse “Hollywood” Hart down and nearly out in the second round, only for Hart to come back with a furious late-rounds rally. Ramirez ultimately prevailed via unanimous decision that September evening in Tucson, Ariz., but Hart, the Philadelphia native with the legendary last name, had rematch on his mind immediately after the decision was rendered. 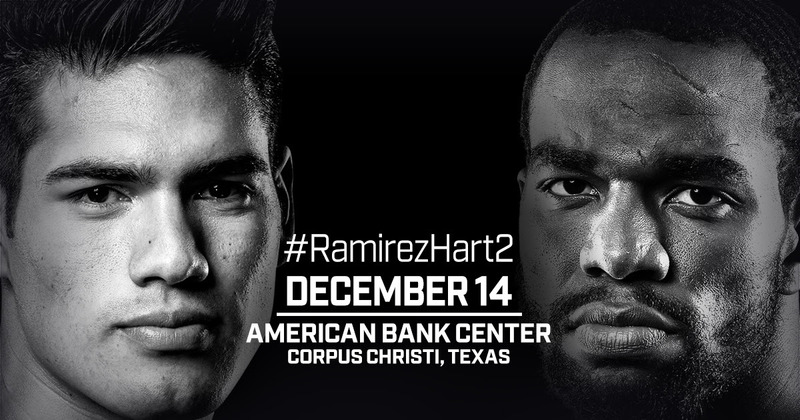 Ramirez will make the fifth defense of his world title against Hart, Friday, Dec. 14 at the American Bank Center in Corpus Christi, Texas. Ramirez-Hart 2 and a soon-to-be announced co-feature will stream live and exclusively at 10 p.m. ET on ESPN+ in the United States — the new multi-sport, direct-to-consumer subscription streaming service from The Walt Disney Company’s Direct-to-Consumer & International segment in conjunction with ESPN. The entire undercard will stream live on ESPN+ beginning at 6:30 p.m. ET.